We never know what added joy or oddity will be tossed into our daily routine. O, what might we stumble upon that will be will peek our curiosity to learn something new, to share with others or if nothing more then adding to our understanding of life, of the world in general. It is another delightful day at one of the many Florida beaches that line the gulf coast. With the miles of white sand, there is plenty of beach property to park our beach paraphernalia. Yesterday Treasure Island, today Pass-a-Grill Beach, we chose to settle a stone’s throw away from water’s edge. The blanket of cool sand has yet to be dotted with sand buckets, noodles, beach chairs or umbrellas. Beachgoers are few at 8:30 AM. The sense of smell picks up a hint of salty ocean air while crystal clear blue green waters gently roll to shore. The surround sound is not that of child giddiness instead, birds of the beach and shorebirds squawk, soar, dive and entertain. There is no hesitation to enjoy the pleasure of a morning swim for the Gulf water easily lures one in at the perfect temperature. Standing in water up to our neck, looking to the seafloor to clearly see the white sandy bottom, schools of small coastal fish (those that inhabit the waters between the shoreline and the edge of the continental shelf) along with seashells and sea creatures… when the water is that clear, that is a perfect day at the beach! With a quick scan of our beach treasures we admire the small collection now scattered on the beach blanket to dry before heading back out, taking one last dip in the cool clear Gulf waters before we depart for home. Please do not disturb or collect a living shell and when in doubt - just leave it where you found it or return it to deeper waters. Oh, about that added joy or oddity I spoke of earlier - we are amused by this creature, found not too far from the shore. At first we thought it might be dead, carried by the current. Come to find out, it is a Macropodia rostrata, a long legged spider crab and very much alive. It applies algae to its thin hairy legs for camouflage. We wonder how it ended up in 3' of water versus the 165' to 500' water depth where it is usually found and preyed upon. Although we did not touch we did take a closer look before letting it continue its journey. Sneaky devil, its camouflage did trick us because at first, we did think it was a piece of seaweed floating by. Now back to the shells collected on this day, I created yard art which lead me to the small box of shells collected over the years. 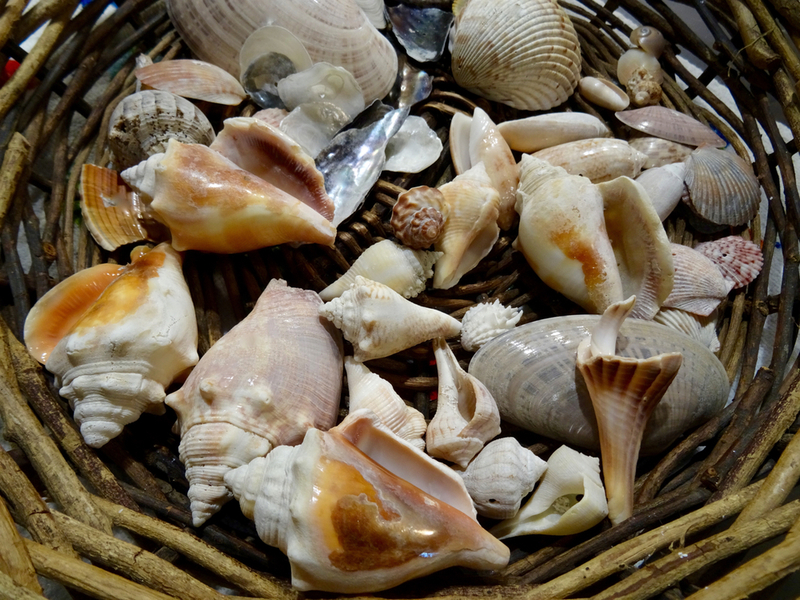 What do you create using your collected shells? Any ideas to share?